Each August the Perseid meteor shower takes place. This year it peaked during a new moon, which offered prime conditions for seeing many meteors. I photographed the Perseid meteor shower in Joshua Tree National Park using two compositions/locations: with Arch Rock as one feature and with a single joshua tree as an alternative composition. 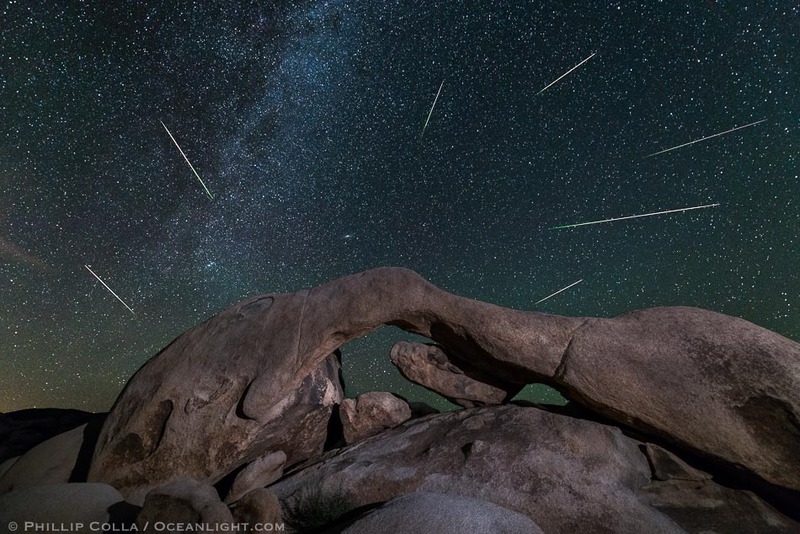 [See the former posted a few days ago: Perseid Meteor Shower over Arch Rock, Joshua Tree National Park.] Note that a completely different set of meteors are depicted in each of these two images. In each case, I rotated the images about Polaris (the “north star”) so that they aligned correctly with respect to the constellation Perseus, the northern arm of the Milky Way and the rest of the night sky. Cheers, and thanks for looking! 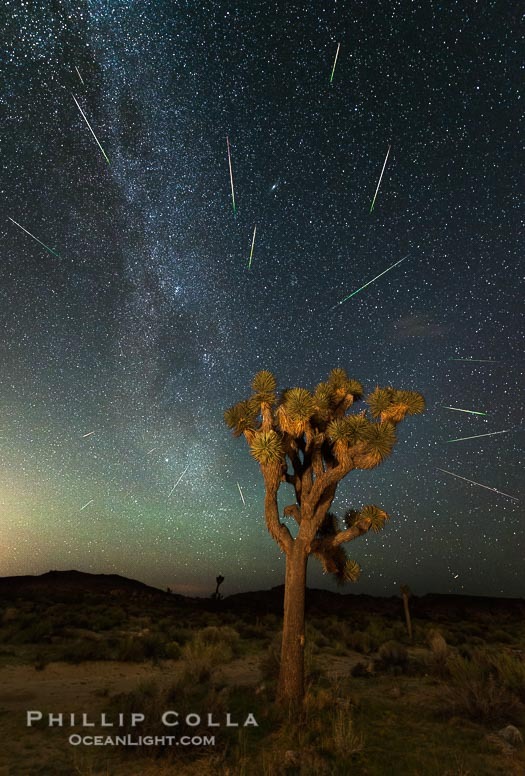 The Perseid meteor shower happens each year because the Earth is plowing through the trail of dust left behind by comet Swift-Tuttle. The Perseid meteors are named for the constellation Perseus in the northern sky, from which the meteors appear to radiate. When sand- and pea-sized debris left behind by Swift-Tuttle collide with our atmosphere at about 37 miles per second, the gases in our upper atmosphere are superheated and glow, often with colors. In the above image as well as in “Perseid Meteor Shower over Arch Rock”, I found that most of the meteor tracks I recorded have a pronounced green color at the beginning of their trail, ending in white or yellow.